These two slightly damaged envelopes were recovered from an Air France Dewoitine 338 plane F-AQBB flying on the leg from Morocco to Toulouse. The plane crashed on 23rd March 1938 into the peak called Cinq Croix only 10 metres below the summit, turned over and fell down the far side of the mountain. The passengers and crew were killed and the mail was found either intact or in a damaged state. Mail salvaged from the plane received one of two cachets in French. 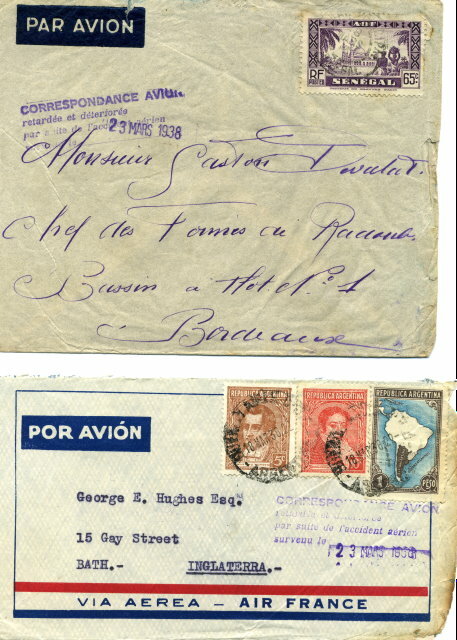 These covers from Senegal and Argentina both received the cachets in violet: “CORRESPONDANCE AVION / retardée et détériorée / par suite de l’accident aérien / survenu le… 23 MARS 1938”.